I really have been slack in making liqueurs this fall. I blame it on my apprehension of having bottles of strange things infusing on the kitchen floor while people go through the house on real estate viewings. bit that wouldn't fit in the bottles. At least that’s my excuse. It’s sad, because I missed out on the flush of local fruit. But it has been too long. So this weekend I decided to rectify the problem. 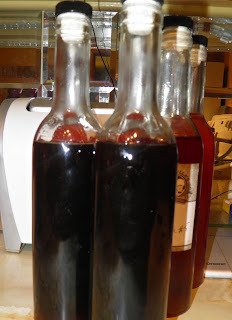 Homemade liqueurs are an amazing gift to receive. Unfortunately most homemade fruit and herb liqueurs take a minimum of one week, with some infusing for upwards of a month or more. Since I was in the country for the past few days I thought it would be prime time to put my time to good use and make some – far away from the prying eyes of potential home buyers. It was a bonus that I chose an “instant” one. As I said, fruit liqueurs take a long time to infuse. That’s not the case with coffee or tea-based. Don’t turn up your nose at tea liqueur. Oolong made a fantastic liqueur last year. It will be made again. I have made two versions of coffee liqueur already, both posted on this blog. First it was French Roast (here). Second was Sicilian, with orange (here). Both turned out perfectly. I decided to try a flavoured coffee for this one. Success again. 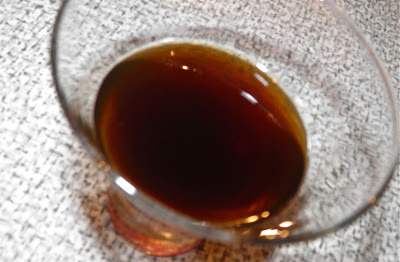 I find commercially produced coffee liqueurs too syrupy sweet. With homemade you can fiddle with what’s in it until you get it exactly the way you want. Just remember, not all coffee beans, and flavoured in particular, are made equal. Some taste disgustingly artificial. Others are pleasingly gentle. Choose a coffee that you really like. 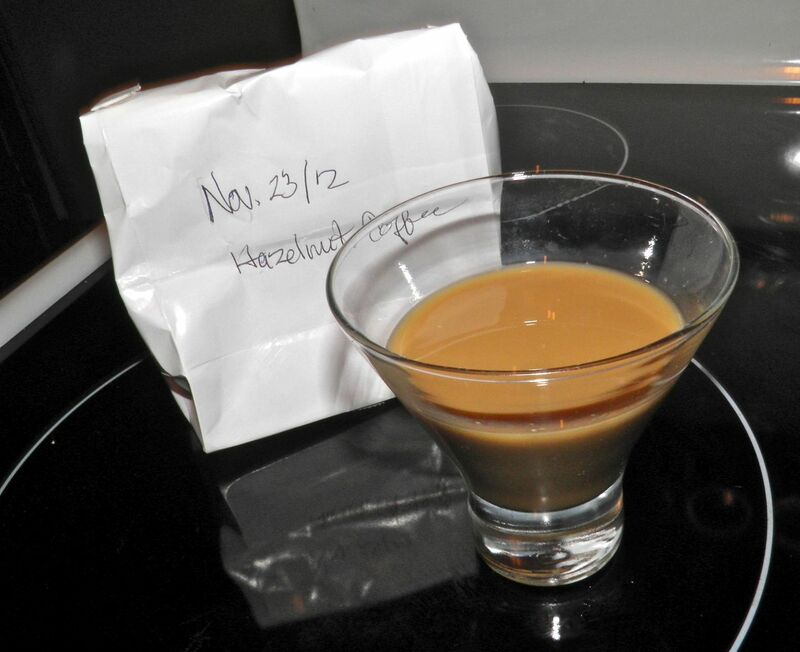 Coffee liqueur is about as easy to make as it gets. Make some horrifically strong coffee, combine with a simple syrup and then vodka. Chill and you’re ready for your Black Russian party. If you’re short on time for a gift for someone you know appreciates things that don’t come from stores try coffee liqueur. Purchase a beautiful bottle for presentation and you’ll have a gift that will be remembered for months, if not years. As a complete side note, I dug out a bottle of my homemade Vermouth No. 5. It appears to be standing up well. It still has complex herbal aromas, plus nice citrus notes. That’s after being made the end of January. The recipe for that one’s listed on this site as well. 2 x 375 ml | about 20% alc. vol. 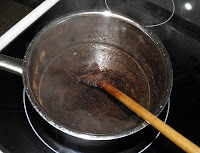 Combine 1 cup of the sugar, 2 cups water and the coffee in a stock pot. Simmer for 5 minutes. Let the infusion sit for 5 minutes and then re-simmer for 5 minutes more. 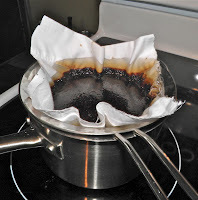 Strain out all the coffee grounds through fine cotton cloth. 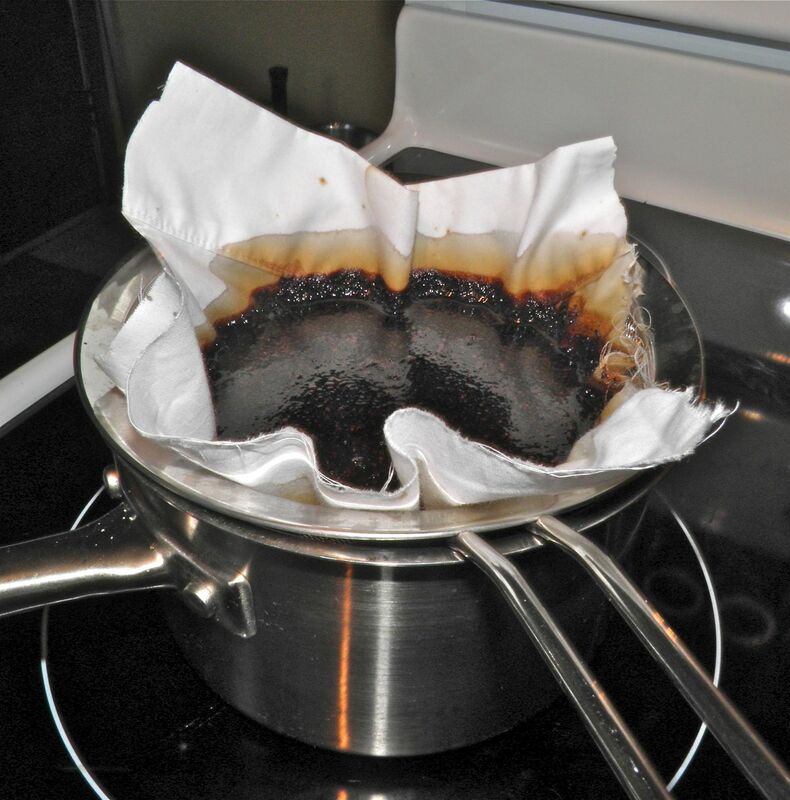 Make a syrup from the remaining 1 cup of water with the 1/2 cup sugar. Simmer for 5 minutes and then combine with the coffee. Stir in the vanilla. Let the liquid cool slightly and then pour in the vodka. Mix well, bottle and chill. As coffee liqueur degrades in sunlight, it is best to keep it in a cool, dark place.